Traveling Vineyard opened its doors in 2001: it's hard to know if you like wine unless you try it first. That thought launched an entire in-home wine tasting concept. It's a unique direct sales company that lets people earn a flexible income by providing a party plan model that's been very successful in the Direct Selling industry. By creating a unique event experience for Hosts and Guests designed to deliver entertainment, education, and fun, Traveling Vineyard is becoming a sought out company. Still in its infancy, specially in the west coast. 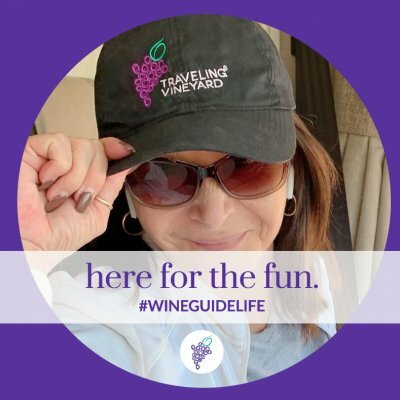 As wine guides we inspire people to make the connection between wine & food, and wine & fun, all from the comfort of home. Traveling Vineyard provides all the training needed so you don't have to be an expert. We are open to most states and now Oklahoma was just opened March 13th. For only $179 (see Success Kit), you can start a home-based business with Traveling Vineyard, an investment my team members make back within 3 tastings. I would love to share this ground-floor opportunity with you, and help you decide if Traveling Vineyard is the right opportunity for you. This is the business you have been looking for! Oregon, Nevada, Washington, California, Idaho, Arizona, New Mexico, Oklahoma, better yet! ...anyone anywhere in the USA lets chat! I know you can be one of many ROCK stars in this company! Becoming a Wine Guide is easy, there is a small upfront investment of $179, the company provides you with all of the tools that you need to host your first tasting, and there are no sales quotas to meet or requirement to purchase inventory. No need to be in the same state to join my team as our wine guides are all over the United States. What is in the Traveling Vineyard success Kit? Sommology material, which includes small containers for pairing samples and sommology cards. Traveling Vineyard's commission structure is that you don't have to pay for your event tasting sets for as long as you host qualified events each time. Each qualified event is $150 in sales and you will earn a 5 bottle tasting set for FREE. We also have a great FAST START program that will help you your first 100 days to earn incentives, cash, and make back you initial investment. It would be my pleasure to have you on my team. Are you ready to change your life and get started? Purchase your STARTER KIT online and remember I'll be your mentor every step of the way. If you prefer, let's chat first 951-903-6677 or email at FABWine101@gmail.com Cheers to you! Hello and thank you for taking some time to research this great opportunity with Traveling Vineyard. A little about me. It was two years ago that I was searching FB for a wine & painting events so a few friends and I could enjoy a night of wine & laughter, when I ran across Traveling Vineyard. I contacted the company not really knowing what they had to offer, it sounded interesting; at least I would learn a little about wine and not just drink it. I talked to a wine guide and I was hooked immediately. I knew that I would gain some knowledge and it looked fun, so I joined. What a great decision this was. I had just retired from the Army after 23 years and thought this would be my perfect DREAM job, one to keep me busy and have fun at the same time. Little did I know I would love what I do and want to share this with everyone I come in contact with. I am now a Team Leader in the west coast (very few of us in the west coast) and I'm always looking to give the same opportunity to everyone who is looking for a new experience. This is the perfect time to get on this ground floor opportunity. Traveling Vineyard has great wines, but what is best about this amazing company are the friendships I have now, and how my life has changed. So many people are finding success as well. I would love to chat with you; if you believe that this could be a perfect opportunity for you, and that you will enjoy getting together with friends, having fun and make money; yes, make money while you sip and chat about wine with your friends, then let's chat because ...Dream jobs do exist! I will be available to help you every step of the way. I have hosted and attended wine parties with Eva. She knows her product. She was very helpful in pairing foods with the wines she selected for my event. I continue to purchase wine from her. Very knowledgeable about wine! Shows passion and love for her job. Party’s are always a blast! She is my go to wine guide! She remembers the kind I like and suggest new flavors I always enjoy. I’m so impressed by the love and passion she has for her business. Very knowledgeable and always delivers a fun environment during her wine events!! She will forever be my go to wine rep. Love her!!! Please use the following form to send an email to Ms Eva Mozqueda #wineguidelife.